To Bogotá faithful: I come as pilgrim of peace and hope. I thank God for all he's done here and in you. I'm also here to learn from your faith and strength in adversity. God needs you, loves you, and encourages you to seek abiding peace. Young people, don't let anyone rob you of joy; let it unite you. Jesus’ love makes it burst forth, and it can set the world ablaze. Change society and accomplish all you decide to! Dream big; don't be afraid! Recognize others' suffering. Dedicate yourselves to the most vulnerable; let their suffering mobilize you. You see everything isn't black and white and so risk falling into relativism, not perceiving the pain of the suffering. You can understand causes of wrongs and see mitigating factors. You encounter each other easily, sharing music, art, and sports. Beyond our differences we're part of something greater that unites and transcends us. Forgive. You don't get entangled in old stories; you're surprised when we repeat events that divide us because of our resentments. Leave hurt and hate behind and look ahead; make us see the Colombia that wants to grow and develop, that needs us all. Help us heal and pass on the hope ready to give second chances. Anxiety sees no way out and harms the hope needed to advance. May your dreams and plans give Colombia new life and goals. Contemplate Colombia's natural beauty without exploiting it. People need your outstretched hand to discern a better future! Build the nation we've dreamed of. You're the hope of Colombia and the Church; in you we glimpse the Messenger of Peace who brings Good News. Everyone, don't let difficulties, violence, or evil weigh you down. Jesus conquered evil, sin, and death; just go out to meet him. Renew society so it'll be just, stable, and fruitful. Entrust yourselves to the Lord, who alone sustains and inspires us. To Colombia leaders: Only through faith and hope can we overcome difficulties and build a home for all Colombians. You're rich in biodiversity, culture, and the human value of your welcoming and courageous people. I appreciate your efforts to end violence and seek reconciliation; it demands everyone's commitment and perseverance to promote a “culture of encounter,” place the human person at the center of all political, social, and economic activity, and resist vengeance and short-term interests. Acknowledge and support each other, heal wounds, build bridges, and strengthen relationships. Your motto, “Freedom and Order,” promotes freedom and a stable order to protect citizens. Let just laws regulate peaceful coexistence, ensure harmony, help overcome conflicts, and help resolve the structural causes of poverty, and so restore dignity to society. Inequality is the root of social ills. Look to the excluded and marginalized. Everyone is needed to create and shape society. Look to the weakest, the oppressed, the disenfranchised, the ignored. Recognize women's contribution, talent, and “motherhood” in their many tasks. The Church is committed to peace, justice, and the common good. Gospel principles can contribute to your growth, especially respect for every human life. Listen to the poor and suffering; learn from them about life, humanity, and dignity. Respond with life despite oppression, plundering, abandonment, disasters, and wars, so that no one will be able to decide how others die, love and happiness will be possible, and once-condemned races will have new opportunities. Many of us accompany you in your steps toward reconciliation and peace! To Colombia bishops: Christ our peace has reconciled us with God and each other! God, Lord of the first step, always goes before us. He revealed the name of the irreversible first step: Jesus, living expression of the love that comes first. When we accept him, we receive the love and freedom to take the first step fearlessly and a compass to keep us on track. Preserve the step God has taken towards you and those he's entrusted to you. You're a sacrament of divine freedom unafraid to go forth out of love. Don't silence him or think success depends on your virtue or others' benevolence. Pray you'll be given something to offer. Prayer is the sap that passes through the vine; keep wrestling with God to receive his healing, then bring healing to others. Showing you're sacraments of God’s first step demands going out of yourself. Always be free to take the first step, draw close to Jesus, leave behind all you we were, to become something you weren't. Be vigilant and docile to the Spirit, or else the Master's features will fade from your faces, the mission will be blocked, and your impulse to preach will weaken. To what else can we aspire than to do God's will? Look to the One who chose you, and accept his decisive judgment. 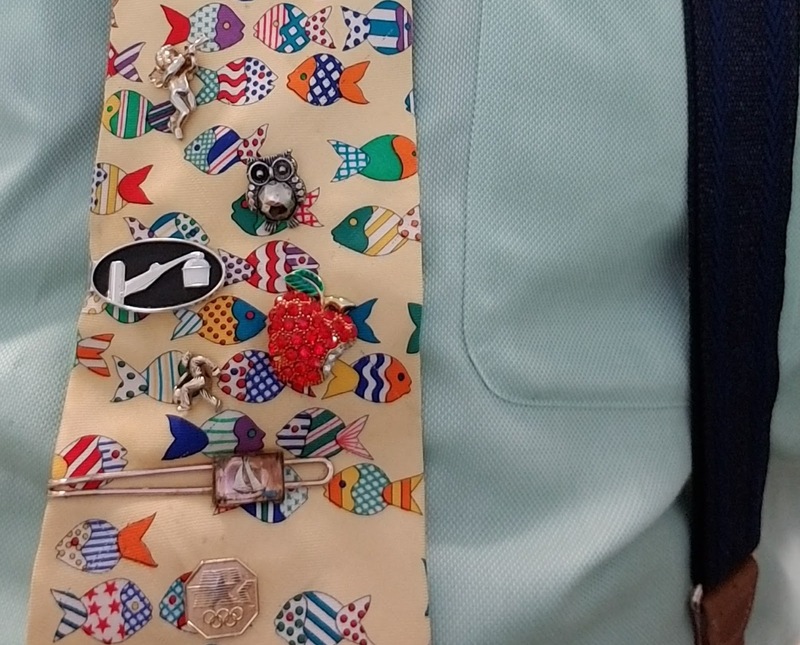 Preserve your unique strengths, sensitivities, regional peculiarities, historical memories, and experiences. Everyone needs to hear the message in their own language. Seek communion; build it through dialogue, taking the first step, and mutual understanding. Don't compromise. Hope in God’s power. Humbly touch the wounded flesh of your history and people. Take the first step towards peace, reconciliation, and overcoming inequalities. Be watchful to renounce corruption and combat poverty and inequality. God will strengthen you and help you discern the right road. War follows our base instincts, but peace forces us to rise above ourselves. Keep believing there's another way besides fear. The Spirit bears witness you're destined for freedom. You're guardians of what makes the nation one. Colombia needs you so it can show its true hope-filled face, engage in mutual forgiveness, believe another path can be taken, and find courage to overcome what generates misery. Make your Churches wombs of light, capable of giving birth amid poverty to children this land needs. Recognize your people's humility, humanity, faith, and yearning for the dignity only the Lord can give. Seek God's glory, the human person fully alive. You're pastors, not mechanics or politicians. Christ is the word of reconciliation; preach that word in pulpits, documents, articles, and in the hearts of individuals. Proclaim it in their consciences. Speak that word with the resource of God’s mercy, which can avert pride and cynicism. The Church seeks freedom to speak that word to everyone, to free them to face their anxieties and find strength to change. Ask them, "Why gain the world, if your soul stays empty?" Colombia has a right to the truth of God, who asks, “Where's your brother?” Fix your gaze on concrete men and women. This approach will unmask cold statistics, twisted calculations, and blind strategies and remind you that only in Christ does the mystery of the human person become clear. Be a Church on mission. Maintain serenity as you serve. Be patient and trust in the good quality of the harvest master's grain; learn from his patience and generosity. Believe in the smallness of God’s seeds. Be drawn to the beauty that leads us to sell all we have to possess divine treasure. Give the Gospel of love; families need to know that they can bear fruit and shelter life. Accept and make room for young people; don't undersell their hopes and expectations. Remind everyone that a drug-laden society peddles hellfire and sows corruption. Be fathers to your priests; go beyond occasional, impersonal, formal communication with them. Be concerned about where and how they live. Do they live as Jesus’ disciples, or have they found other forms of security? They need your closeness. Priests have to feed the crowds, but God’s food only comes from our poverty, which encounters God’s bounty. Help them hear Jesus ask, "Who do you say I am?" and answer “The Christ, Son of God,” so they may give themselves and accompany the Lord. Show concern for formation of your priests; implement the Ratio Fundamentalis Institutionis Sacerdotalis. Show concern for the lives of consecrated people; hear in them the Bride’s cry of love. Help form your laity; help them contact the community's faith and appropriate Spirit-awakened experiences and responses. Learn from the indigenous peoples the sacredness of life, respect for nature, and the recognition that technology alone can't fulfill us. Ask the Lord through the Blessed Virgin for renewal of Colombia. May God shine his light and bless the Church here. Col 1:9-14 May God fill you with knowledge of his will to walk in a manner worthy of the Lord, bearing fruit in good works and growing in knowledge of God, strengthened for endurance and patience. God delivered us from the power of darkness and transferred us to the Kingdom of his Son, in whom we have redemption. Ps 98:2-6 "The Lord has made known his salvation," justice, kindness, and faithfulness. Sing praise to the Lord! Lk 5:1-11 Jesus saw two boats alongside the lake, got into Simon's, asked him to put out a short distance from the shore, taught the crowds from there. 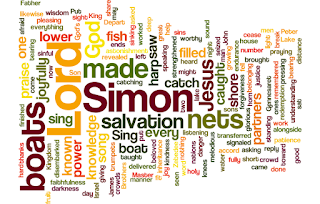 Jesus / Simon: “Put out into deep water for a catch.” / “We've worked hard and haven't caught anything, but if you say so....” They caught so many fish that their nets tore, then signaled to the other boat for help. Both boats filled to the sinking point. “Leave me, Lord; I'm a sinner.” / “Don't fear; you'll be catching people.” They left everything and followed him. Creighton: Does Peter's pattern of listening for God apply to you? I start my day with a to-do list, am tired at the end, vs. I start my day immersed in God’s word, experience dependence on God, connect with God, hear him, end the day calmer, more grateful, alert, more aware how God is working. Being a fisherman, of fish or people, has a lot to do with being attentive, being in the right place at the right time, immersed in God’s word, acting on God’s voice. One Bread, One Body: "More fruit": Spiritual fruitfulness is based on obeying Jesus. When we obey the Lord, we'll see God's glory. When we're fruitful, a war explodes: the Lord calls us to overcome fear, repent, and do great things than we, or even Jesus, have done before; the evil one rages at us. But if we die to ourselves and live in Jesus, we bear abundant fruit. May we obey and live in Jesus and so grow from "grace to grace" and "glory to glory." DailyScripture.net: "You'll catch people for God's kingdom": The crowd pressing on Jesus was hungry for God and eager to hear him. 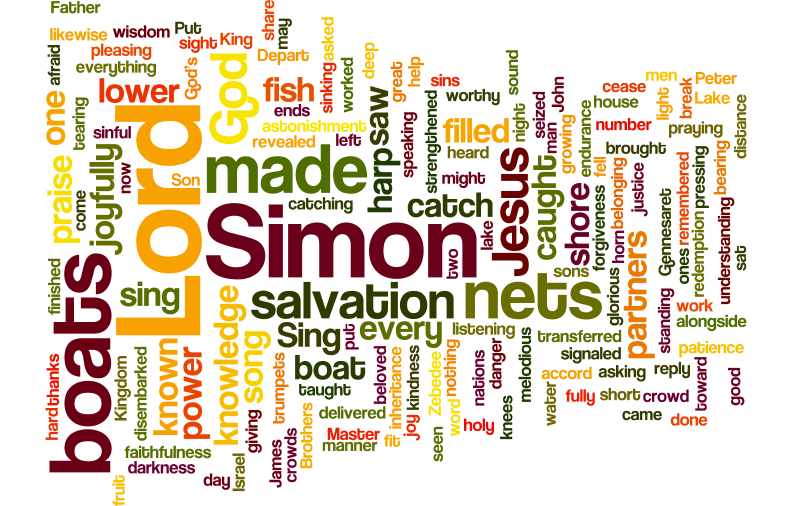 Though Simon was weary from working all night, he did what the Jesus told him. When I meet disappointment, do I hear the Lord's word and heed his command? God expects of us greater things than we can do ourselves. "Jesus has such love for us that he wills that we have a share with him in the salvation of souls. He wills to do nothing without us. The Creator awaits the prayer of a poor soul to save others redeemed at the price of his Blood" (Thee´re`se of Lisieux). When God's word is spoken, his kingdom is revealed and power released. When people respond with faith and obedience, they're changed and made "a new creation" in Christ. God chooses ordinary people as his ambassadors and he uses our ordinary circumstances to draw others into his kingdom. If we allow Christ's light to shine through us, we too will "catch people" for the kingdom. "Thanks be to God, who in Christ leads us in triumph, and through us spreads knowledge of him. We are the aroma of Christ to God among those being saved and those who are perishing."